With so many beautiful cities and locations in just one country it is difficult to know where to choose for your Italian language holiday. So the Cactus team have come up with their top 5 places to learn Italian to make the decision a little easier. To book any of our courses please call us on 01273 830 960 or email us. Our multilingual team will be happy to answer any questions you may have. Venice is a strong favourite with the Cactus team. The best times to visit are May and June, September and early October, when you can avoid the summer crowds. A magical, enchanting place, if you side-step the main streets and escape into the hundreds of alleyways and canals that make up the city, you will feel like you are stepping into another world, in another time. The beauty of Venice has to be seen to be believed and although the city attracts over 20 million people every year it is still possible to find a spot away from the masses and appreciate this romantic, mystical place in your own time. 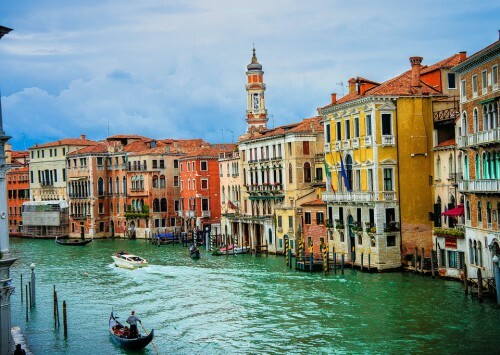 Venice is the perfect place to be truly inspired to learn and speak Italian. Often synonymous with the mafia Sicily is a lot more than godfathers and gangsters. As the largest island in the Mediterranean Sicily it has been a crossroads of cultures for 3,000 years which is reflected in its history, architecture, cuisine and ancient ruins. As the capital of Sicily, Palermo is full of charm and adventure. The busyness of the colourful markets and street life, the offerings of seafood, ricotta, basil, aubergines and lemons, the vision of Mt.Etna, Europea��s highest volcano, looming in the background, all make Palermo very real and very Italian. And we havena��t even started with the beachesa��..
Salerno is the gateway, the open door, to what is possibly Europea��s most stunning coastline. Situated at the eastern end of the Almalfi coast the views from Salerno are more than impressive. The proximity and accessibility of the Almalfi coast makes every morning you wake up there a morning filled with excitement and anticipation and potential discovery. Boats from Salerno to the Almalfi Coast, with various drop off points, take around an hour, so ita��s very easy to take your Italian classes in the morning and spend the afternoon in one of the Amalfi villages, sipping on a cappuccino or limoncello. The Island of Elba, a Tuscan Island situated to the north-east of Corsica, is a little known gem, surrounded by turquoise blue seas, with pristine beaches and a relaxed vibe. The island is famous for harbouring Napoleon in 1814 during his exile and he resided in the beautiful Palazzina dei Mulini. The stunning beaches with clear seas that could compete with Caribbean islands are what draw people to Elba, and are what make them wish they could stay a lot longer! Where better to take an Italian language course and have a holiday to remember. Firenze (Florence) is the tangible embodiment of the Italian Renaissance which can be visited, seen and heard today a�� by anyone who is lucky enough to visit one of the most cultural and impressive cities in Europe. The pleasures of Florence are not limited to Florence but also include the beautiful surrounding area, encased by the rolling Tuscan countryside, olive groves and wine-growing hills of Chianti. The cities of Siena, Pisa and Lucca are easily accessible and should not be missed. Where better to learn Italian than at the birthplace of Dante, Da Vinci and Donatello? Previous Previous post: What Language Should You Learn?